Alimony is awarded as part of a final divorce decree. The parties may also agree to alimony in mediation or as part of a settlement, which becomes legally binding when a judge signs it. Although alimony traditionally has been awarded to women who stayed home with families while their husbands worked, either party may be awarded alimony. The party who makes less money is typically the one who receives alimony. Traditionally, alimony was awarded for the life of the recipient or until the recipient remarried. 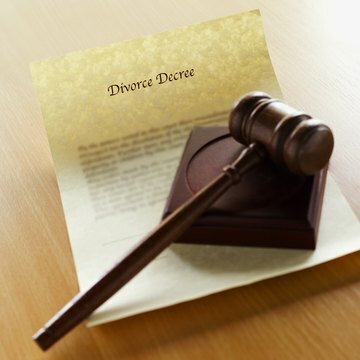 Rehabilitative alimony is designed to enable a person to live on her own after a divorce. When one parent stayed home with the children, compromising her earning power, rehabilitative alimony may be awarded for a set period of time to allow her to regain job skills and seek employment. A spouse with a serious injury or disability may also be offered rehabilitative alimony. Rehabilitative alimony arises from a disparity in the parties' earning power, and is most commonly awarded when the recipient's contribution to the marriage compromised her earning power. Nominal alimony is an award of a nominal amount of money. The award can be as small as $1 per year. The purpose of nominal alimony is not to support the spouse. Instead, it is to preserve the court's jurisdiction to award a larger alimony payment in the future. Nominal alimony may be issued when the payer has a temporary loss of financial status due to child support obligations, temporary disability or other factors. When the payer's financial situation improves, the recipient may go to court to seek a larger alimony payment. Judges have the power to award alimony for set periods of time or until certain circumstances are met. For example, alimony may last until the recipient completes college, until the children turn 18 or until the recipient obtains gainful employment. Alimony may also be awarded on a permanent basis, or until the recipient remarries, but this arrangement is increasingly less common. The Law Offices of Nugent, Zborowski and Bruce: What Is Nominal Alimony? Family Law, 4th Edition; Leslie Harris et al. If your marriage ends, you may ask the court for alimony, or spousal support, as part of your Maine divorce decree, but alimony is not automatically awarded. Unlike child support, there is no calculation method for alimony. So, your divorce judge has wide discretion when deciding whether to award alimony and, if so, how much to award.